There is something special about Rome in the winter. While the weather may be grey and dreary most of the time, the sun occasionally comes out and the sky radiates a blue brighter than the clearest summer day. The warm colors of the buildings seem to be enhanced, and the people even seem a little bit more cheerful as they walk somewhat more hastily, with runny noses and rosy cheeks. Small dogs proudly accompany their owners, wearing red knit Christmas sweaters. Toddlers and grandfathers alike bundle up in those oh-so-characteristically-Italian puffy coats. While the sun sets early, the cool cotton candy colors set a mood which cannot compare to the fiery skies from the summer sun. The brown tree branches alongside the river have died in a glorious series of arches that stretch as far as the eye can see, making a sort of tunnel effect for people who walk under them. ​Best of all, it is still possible to sit outside and enjoy the lively atmosphere thanks to many restaurants’ outdoor space heaters, and sometimes even complementary blankets. Winter in Rome is a magical place, filled with small shops selling handmade Christmas trinkets, and children running back and forth between the wooden stalls and the carousel at the Christmas market in Piazza Navona. The streets are silent, and it is as if the whole city has bundled up inside to stay warm. The only noises heard are the occasional screeching of tracks from the tram as it passes over Ponte Garibaldi or the church bells which chime from every which direction each hour. Apartments, on the other hand, are a different story. Most complexes are older than the United States as a country, meaning those damp and rainy days tend to creep inside. In this case, the only solution is to curl up with a blanket and greet the dampness with a bowl of warm tomato based gnocchi - the ultimate comfort food - and a cup of rich Italian hot chocolate… or red wine. Perhaps winter is the best time to visit Rome, the real Rome. Where street vendors are too cold to even bother you, where waiters don’t automatically speak English to you, and where you can truly catch a glimpse of this magical city all to yourself. I love the thought of Winter in Rome. Less crowds, no heat and the perfect excuse for a hearty pasta! Thank you Melanie! Rome in October is very nice as well. It's not nearly as hot or crowded as August and the produce in the fall is by far my favorite. Make sure to try pumpkin ravioli, soup, or persimmons! This was beautiful! It was as if I was reading a book. I have never been to Rome before, but after reading this, I really want to go in the winter now. Thanks for sharing! Thanks for reading Alexis :) I'm glad you were able to see the visuals! Thank you for reading Joyce! I have a friend from Canada and he once told me that it gets so cold there that you have to wear goggles so you're eyes don't freeze!! I'm not sure if that's true or not.. he's quite the jokester... but it sounded dreadful! Oooh, this sounds heavenly! I've never been to the Continent, but I'm a sucker for good light and gorgeous views. Thank you Emily! It's definitely worth a visit :) Cute fashion blog, by the way. 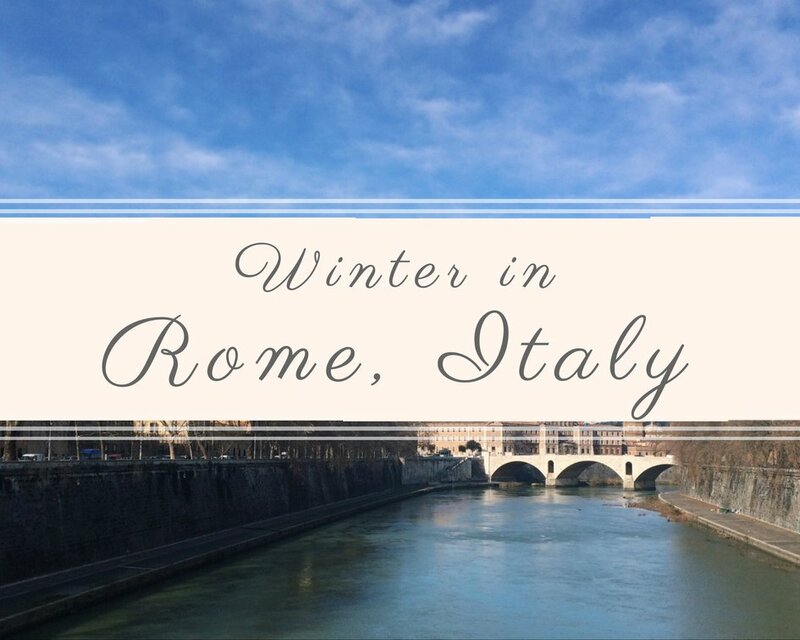 Rome sounds so wonderful in the winter--might have to swap it with some other destinations! Thank you for reading, Angela! Rome is a true 4 seasons city: always beautiful! All four seasons are really present. It's so different for me, being from Florida. Each one comes with it's own gifts. Thanks for reading! Thank you for such a beautifully written post! I could actually picture myself there with you! Thank you for the kind words, Brooke. You should totally come visit!! Sounds like a great place to visit! Agree Italians make the best comfort food. Each season has it's own definition of beauty. Rome is a place that I could return to over and over again and always discover more. This seems so peaceful and like the perfect vacation for the winter. Thank you, Veronica. It's a great place to visit! Really interesting! Sometimes I love visiting a place "out of season" to see what it's really like without all the tourist focus. Awesome to know we can do the same in somewhere as great as Rome. Thanks for reading Bruce. Rome is never completely free from tourists, but the months from December - February are probably the most empty. Very picturesque. I need to visit Rome soon! This makes me miss Rome! Thanks for you beautiful pics and insights. I went to Rome two winters ago and loved it! We had so many places to ourselves and really got a taste for the Italian culture -- way more so than when I went in the summer nine years ago! It's so true. You really have the entire city to yourself. I'm so glad you returned to Rome after the first time in the summer! Wow! That would be super cool. I know they shoot off a ton of fireworks over the Colosseum! I'm not a winter girl either (from Florida, here), but Rome isn't unbearable. Best wishes! Wow. Rome looks beautiful and heavenly. It certainly is beautiful! Thank you for reading my blog, Saidat. Hey Brianna! Thanks for reading. Rome typically stays above freezing. Although, it dropped down to about 30 degrees, and gave the fountains just enough time to freeze over before warming up again. Right now, it's in the 50's. I have been to Rome some years ago in the summer time and it was awful. Waiters everywhere trying to persuade me to take a break at their restaurant/cafe, too many foreigners of various nationalities in big crowds walking with their guide in front and the city was just too crowded and noisy. Wow these pictures are beautiful! You're totally giving me the travel bug! I haven't been to rome in years and now I want to go back pronto! What a wonderful idea. I may have to work this out for next winter. What beautiful photos! I would love to see Rome in winter :) Also really enjoyed your descriptions. Rome is somewhere I've always dreamed of going. I don't know why but I've only ever pictured it in the summer. Looks fantastic in the winter too - maybe I should try it soon before the weather warms up! So ccol! I need to go back. 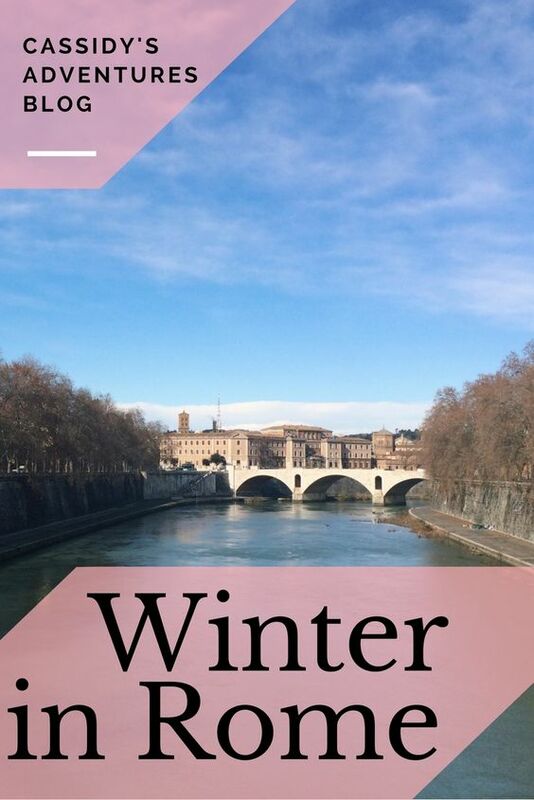 Winter in Rome sounds so much better than a madhouse of tourists. Not sure when I'll be heading that way, but if I do, I'll think about vising in a cooler season. The idea sounds A-M-A-Z-I-N-G . I soooo wish to make it there during the winter! Rome, the eternal city! I don't like it particularly, mainly because or the Romans. The city would be much better without them, but it's true that in winter Rome is better. I went there several times to see some friends or attend some concerts, and during the low season it's more enjoyable, maintaining its immortal charm. True, the water is not so good as in summer, but it's also difficult to have very low temperature, so in a way or in another, going outside is still pleasant. I shun the idea of travelling during winter because of the cold. But I learned to conquer this fear when my family had a holiday in Canada last month. Also, the fares are cheaper and there's less tourists during winter. Who knows, we might find ourselves in Rome in a couple of weeks. These pictures are very beautiful great review on the city i would love to visit Rome maybe in spring. Hmmm, Rome in winter... Not a bad idea! We took a two-week road trip through Italy last fall and completely bypassed Rome. Some friends had just been there and hearing their stories about the long lines and crowds at every attraction totally turned us off. We'll definitely consider it though for a long weekend trip this winter! That is understandable! Where in Italy did you go? Perhaps the winter is the perfect time for you to visit! Going on winter is actually pretty good idea. You're right, you take better pictures because it's not crowded. You get to enjoy the view and hotels are more affordable. Yes, I understand! It's so much easier to take photos around the city when there aren't a billion people standing in your way! I am not sure if I can enjoy Rome in winters with life at almost standstill. But then if Colosseum and other ancient ruins have layers of snow on them it will be fun photographing. I have Delphi of Greece in winters, enoyed the snow layers there. Wow, we had not thought of visiting Rome in winter. This is such a brilliant idea. The sky looks amazing. Do you get a lot of sunny days in winter? The picture of the canal with the blue sky is stunning. I love traveling off season; it seems you get a far more local experience. I had not thought of Rome in the winter before, but you make it sound so poetic and lovely! Hahahaha this comment truly made me laugh out loud! My only two trips to Rome have been late November and early March. Not the dead of winter, but not summer time either. Coming from the northeastern United States, I didn't mind the weather there at all. It was a welcome reprieve from Pennsylvania. "Winter" is a Rolling Stones song! You make going to Rome in the winter sounds great. When we went in the summer it was overcrowded. There were street vendors everywhere trying to sell selfie sticks. It was also hot as hell and we ended up relaxing under some trees for a large portion of our time there. We don't regret it though, it was still amazing to see. Oh, curl up with tomato based gnocchi and red wine. Yes please. I absolutely love everything about Italy and am so glad it's our neighbor to the south. I can't think of enough excuses to get to Italy. And with the new train from Zurich, we get there even faster. That's awesome!! I am going to look into that train! Switzerland is on my bucket list for 2017. I haven't been to Rome . But you have given me some great reasons to be in Rome in winter. Probably I should think about this soon. Photos are quite inviting and I must tell u that. Though winter already gone in my country, I don't know how about rome. If it continues I've a target to visit there. It's still pretty cold here! You should visit! I was NOT a fan of Rome when I went. Probably because I was forced to go during the summer (had a wedding in Bolzano) I love going places on the off season so I will have to go back when there are far less people! I hate when those street vendors annoy you! Yes, the street vendors can be rather aggressive sometimes. It helps me to remember that they are refugees and usually good people (even if they're annoying). Most of them have incredible stories. Family and kids back home. And they're making next to nothing just to try to support their loved ones. Such a poetic way to describe such a beautiful place! I have always wanted to see Rome - now I want to see it even more. As Italian I totally agree with you, Rome is so beautiful in winter, less crowded than summer and absolutely enchanting. Even I totally prefer spring, weather is good and the city looks more liveable. I went many time to Rome (I'm from Sardinia) and everytime I discover something new, "the eternal city" as we use to say...that's totally true. Oh winter in rome just sounds so lovely even with im sure some drawbacks. I'd be more than happy to curl up with a blanket with a glass of hot coco.